But I like making festive treats no matter what the weather is like. 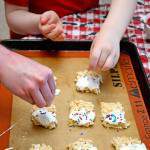 I could have just made some regular rice crispy treats but what would be the fun in that? I had the kids help me, since they are really good helpers in the kitchen. 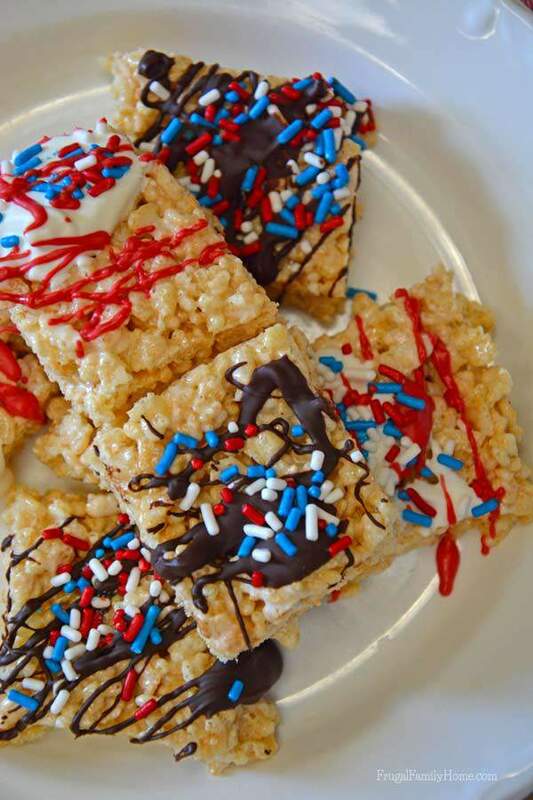 We decided to decorate our rice crispy treats with some patriotic sprinkles and a little chocolate. Isn’t everything better with chocolate?! We made our rice crispy treats in the microwave. It was quite a sticky job getting all that marshmallow goodness into the pan. But we managed and got to lick a few fingers when we were done. Then we had to wait for them to cool before we could decorate. We did do a little sampling though. 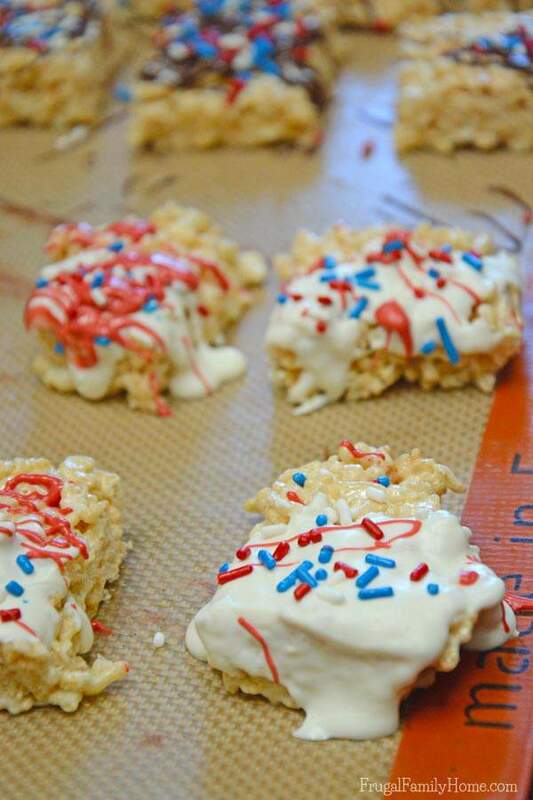 I had some red and white candy coating to add to the rice crispy treats, along with some chocolate chips to melt. I thought it might be nice to put the rice crispy treats on sticks, like I saw on Pinterest. (Be sure to go over and follow me if you don’t already) But I guess ours had a little too much margarine or something. I couldn’t get the treats to stick to the popsicle sticks to save my life. They kept oozing off. 🙁 So we went decided to go with squares. After I sliced them into serving sized squares and had the treats on the cookie sheets, we started to decorate them. I drizzled the chocolate and candy coating on them. Since I overheated both the candy coating and the chocolate a little and burned myself picking up the bowls. I didn’t want my kids to get burnt. The kids had fun adding the sprinkles. My son loves lots of sprinkles. Some of the treats ended up with a bunch of sprinkles on them. Grease a 9 by 13 inch pan and set aside. Melt the margarine and marshmallows in a large bowl, I use the microwave and heat the mixture in one minute intervals, stirring after each minute until melted. Add the cereal to the marshmallow mixture and stir well. Press the mixture into the greased pan and let cool. Then cut into squares and place on a cookie sheet. Melt chocolate chips or candy coating. Drizzle on top of the rice crispy squares. Sprinkle with sprinkles, if desired. Let cool until the chocolate or candy coating is set. 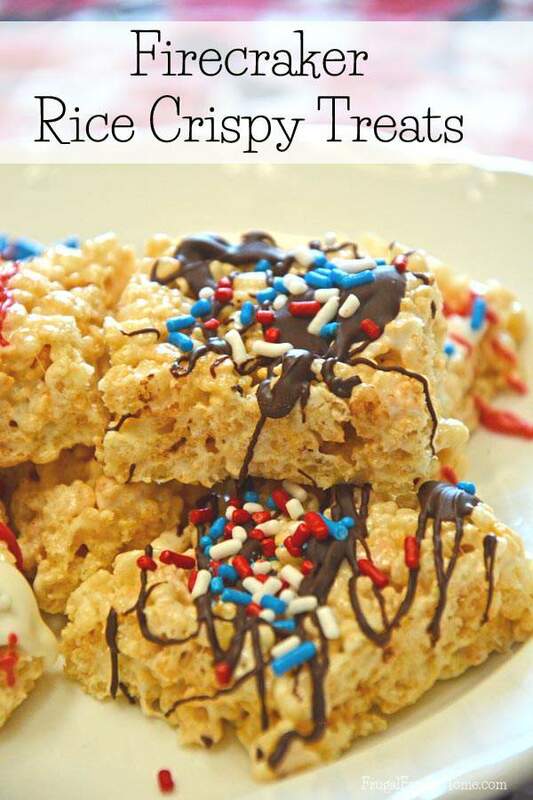 Do you make rice crispy treats? 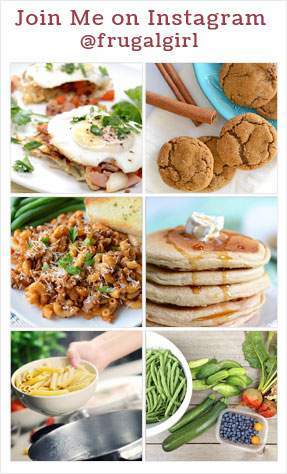 What’s your favorite way to make them? 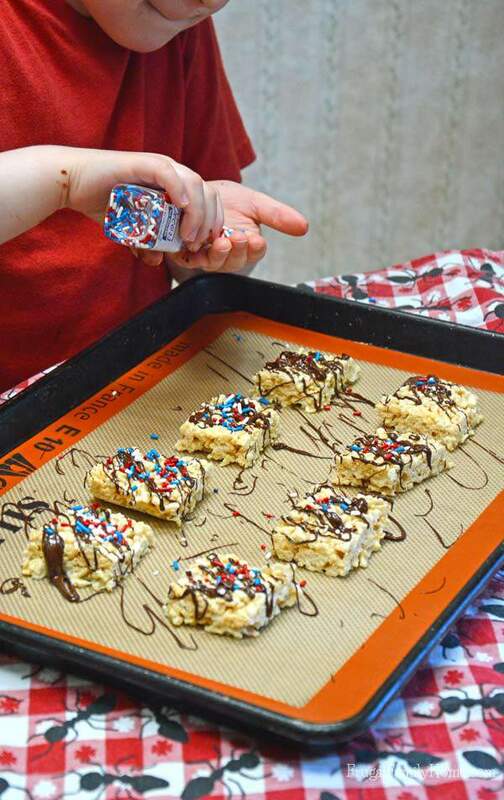 What a fun and easy way to make rice crispy treats more festive for the 4th of July holiday. 🙂 I know my kids would love to do this. 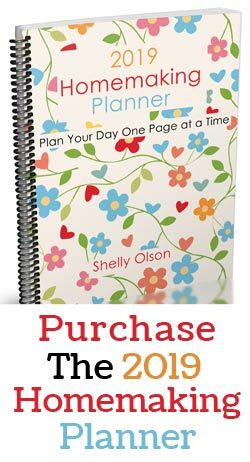 Thanks for sharing, Shelly! Life is better with sprinkles! 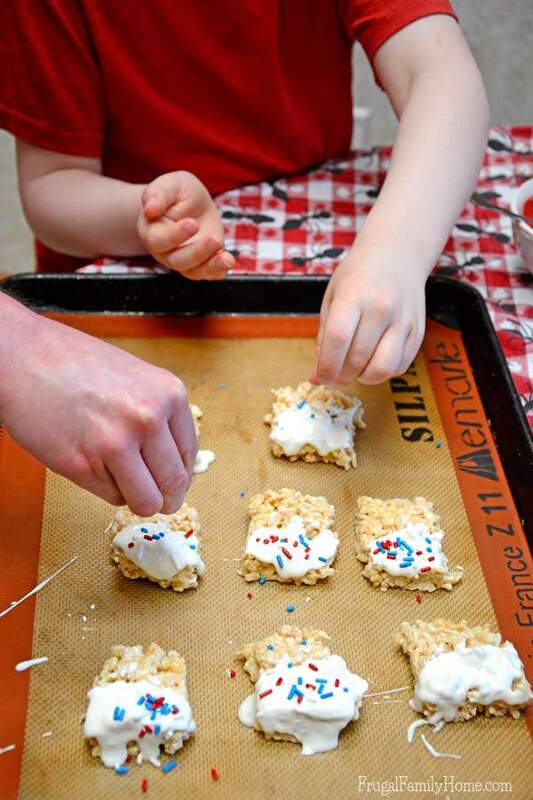 Thanks for sharing this easy and red/white/blue patriotic recipe!